Wolf cooking products, the gold standard in cooking appliances, is an innovator and industry leader in manufacturing outstanding products for the home cook. Sub-Zero Corporation acquired Wolf Appliances in March 2000. It was the perfect marriage of these outstanding brands. 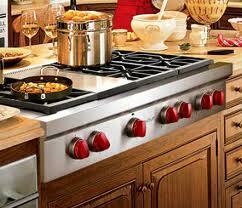 Cooking and refrigeration — fire and ice! Cody’s Appliance Repair is proud to say that we are factory authorized for warranty services for Wolf Appliances. What that means for you, the consumer, is that our company participates in ongoing training and education to keep our skills sharp and up-to-date about new products and innovations in our industry for the Wolf brand. Our technicians are factory trained by the manufacturer, as well as background, drug, and alcohol tested for your safety and security. We carry a full range of Wolf parts right on our trucks, to ensure a faster repair whenever possible. If you need Wolf Appliance Repair in Boise, Eagle, Meridian, Nampa, Caldwell, Star, Middleton, Emmett, Kuna, Garden City, or Horse Shoe Bend, call us at (208)938-1066 today or schedule right here online! Our Wolf appliance repair Boise technicians are here to help.